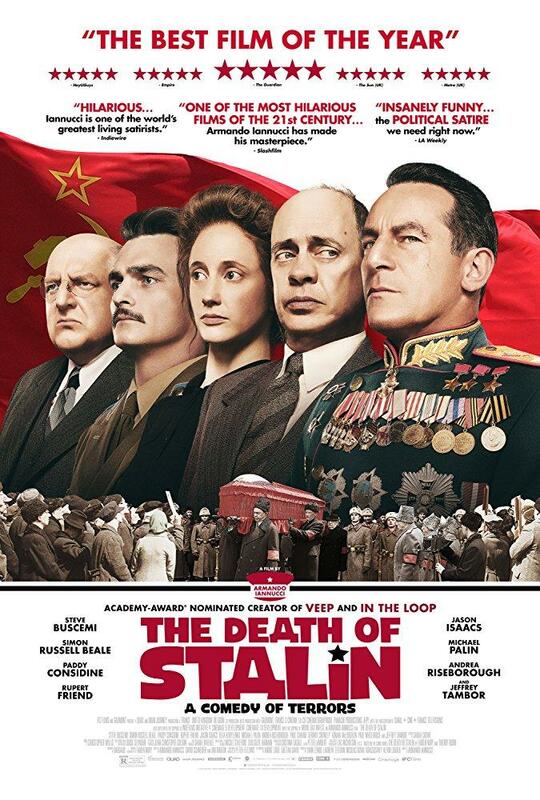 Jump back to the year 1953 in the chill of the Soviet Union to experience Armando Iannucci’s theatrical account of Joseph Stalin’s death and the backstage fiasco of appointing a successor in Death of Stalin. Originally written as a French graphic novel, La mort de Staline, Iannucci develops a rather trivial and comical plot within a historical tragedy. Released in the U.S. this March, Death of Stalin has caught the eye of multiple film critics due to its blazingly-irreverent comedy and ingenious cast with the likes of Steve Buscemi (Nikita Khrushchev), Jeffrey Tambor (Georgy Malenkov), Michael Palin (Vyacheslav Molotov), Simon Russell Beale (Lavrenti Beria) and more. These comrades maneuver through the political landscape of communist Soviet Union, attempting to outrun the other to the top. Full of backstabbing and manipulations, the plot becomes entangled with skepticism and pandemonium. Only the history buffs know how this plot line turns out. Although Iannucci sprinkles truth here and there, Death of Stalin is by no means a historically accurate documentary. Many aspects of Beria’s character and the NKVD have been deemed false by historians of Stalinism. In my opinion, the most innovative part of the film was the concept of taking a horrific period of world history and warping it to be laughable, even as dissidents of Stalin’s regime are arrested and murdered on screen. If you are looking to pay your respects to the victims, I suggest you run very far the other way. Yet, through Iannucci’s uncomfortable neglect of the victims, he really highlights the horrors Stalin initiated and often gets away with in the shadow of the infamous Hitler. The excessive gore and heinous violence is presented in a Tarantino-esque way, adding to the blasphemous humor. The comrades’ personalities are caricatured by the actors in a manner that is almost too absurd to be true — the conniving Khrushchev, the shaky Malenkov, the monstrous Beria and the relentlessly dutiful Molotov. While watching this blustering crew, the overwhelming sense that there are no good guys to root for becomes evident quite early on. Perhaps, that is a political statement in itself. Dark comedy is an odd animal, both uncomfortable and absurdly flippant. The jokes are more subtly rooted in satirical social commentary. They are meant to prod at the mind long after the joke has concluded. Death of Stalin does this in two ways — it exhibits the dangerously finicky nature of the Soviet Union during this time period and the outright atrocity of tyranny. These themes are so ludicrous in reality that it is almost funny how humans could possibly act this way. Perhaps Iannucci resonated with this concept and simply ran with it. In total, Death of Stalin is not a Hollywood film. It tells a story that harps the themes and the feelings associated with those themes, rather than capitalizing on a climatic and flashy production. Iannucci painted this film with a balanced hand of restraint that told a dark, twisty story in a striking way.